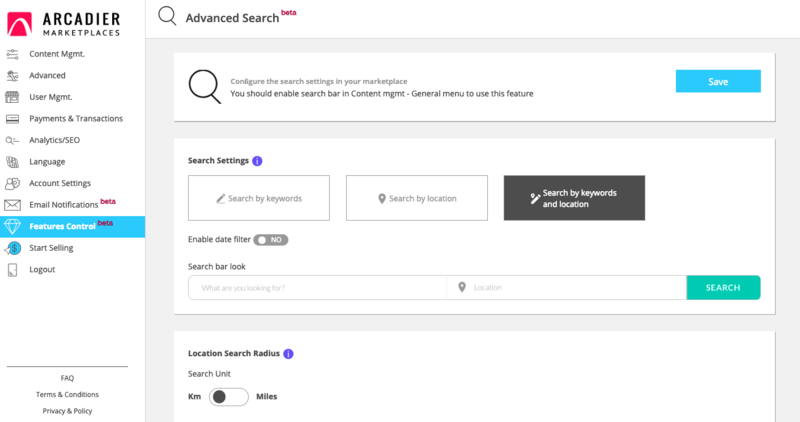 As the administrator of a rental or service marketplace, your search bar can be configured for the search terms most relevant for your users. By changing your search bar, your users can either find a listing with keywords-based search terms (e.g. Central Park view & apartment), a location (e.g. Manhattan) or both. To enable a keywords-based search only, click on 'search by keywords' as in the screenshot above. Click 'Save' on the top right corner to ensure these changes are saved. To enable a keywords-based search only, click on 'search by location' as in the screenshot below. Remember to set your search radius if you have not already done so. Finally, click 'Save' on the top right corner to ensure all changes are applied. To enable both keywords and location searches, pick the right-most option, as per the screenshot below. Remember to set your search radius if you have not already done so and click 'Save' on the top right corner. You can also change the location search radius of your marketplace by choosing a radius from the dropdown in the Location Search Radius portion below. Do note that 20,000km or 10,000miles would be a worldwide search.